Wasserfront. Das Hotel liegt direkt neben 101. 3mi zum Frühlingstrainingsort. In der Nähe von vielen bekannten Golfplätzen. Zentrale Lage zu vielen Bereichen in Phoenix für Kongresse und Spaß. Neu eingerichtet und bereit für Ihren Genuss! Zuhause ist auf dem See mit herrlicher Aussicht. Blick auf die Berge von vorne und Wasser von der Rückseite des Hauses und Pool. Gewölbedecken, Art Nischen, geräumige, formale Wohnzimmer mit Erker, Den Blick auf Pool, Huge Hauptschlafzimmer mit eigenem Ausgang zum Pool. Whirlpool. 2 begehbare Kleiderschränke im Master. Granit und alle Edelstahl-Geräte, neue Frontlader Waschmaschine und Trockner. Privater eingezäunter Garten mit beheiztem Pool und Springbrunnen. Grill im Freien. Luxusbettwäsche, Matratzen und Handtücher. Alle Schlafzimmer haben Fernseher. Kingsize-Bett im Master, Königin im Schlafzimmer 2 und 2 Zwillinge im Schlafzimmer 3. Plüsch Dekor und luxuriöse Bettwäsche, wird dieses schöne Zweitwohnsitz nicht enttäuschen. Genießen Sie die spektakulären Sonnenuntergänge vom beheizten Pool oder dem komfortablen Wohnbereich im Freien. Dieses Haus wurde für Arizona Urlaub leben gemacht! Manager lebt in der Nähe, um bei Fragen und Bedürfnissen zu helfen. The property was perfect for us. We had plenty of room. It was clean and comfortable. The location was great and Jaci the Manager was wonderful. I would recommend highly !! We loved our stay! The house had everything we needed, the heated pool was fabulous for a cool February week, and the pontoon was a fun addition to our stay! We would absolutely stay again! The location was great for Spring Training games. We really enjoyed the pool and being on the lake. We would definitely recommend staying here. Just returned from our 30th anniversary trip that we shared with our young adult children at Bill and Samantha's beautiful property in Glendale and can easily say that this trip will go down in the books as one of our favorite family vacations ever. The entire process from making the reservation to check out was seamless. The owners, and property manager, Jackie were friendly, helpful, available, and responsive. 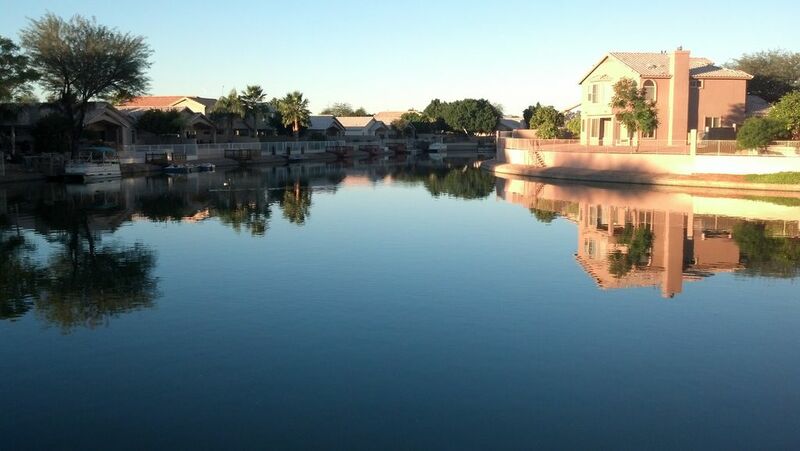 The property is located in a peaceful neighborhood that has great access to just about any activity you want to participate in while staying in the Phoenix area. We especially enjoyed the nearby hiking trails, Spring Training games, and relaxing by their private pool overlooking the lake. For the bird lovers, the lake in the backyard attracts numerous feathered friends. On the morning of our anniversary we were especially surprised and delighted to be greeted by a pair of rosy-faced love birds who appeared to be preparing a nest in the large cactus in the front yard. Once we discovered the pair of love birds, saying hello to them every morning became part of our vacation routine. The home is clean, beautifully furnished, and well equipped with anything you could possibly need to keep you comfortable on your vacation. We definitely will return for another stay! Everything about this house is great. It has location, pool, waterfront deck, very well-stocked kitchen, responsive property manager and host. It is clean and comfortable. It easily handled three couples for this stay. Definitely recommend staying here. YOU CAN SAVE MONEY BY CONTACTING US DIRECTLY PRIOR TO BOOKING. FOR STAYS OF 30 DAYS OR GREATER A DISCOUNT OF 10% WILL BE APPLIED TO THE NIGHTLY RATE. IF YOU CHOOSE THE REFUNDABLE DEPOSIT YOU SAVE THE COST OF THE NON-REFUNDABLE PROTECTION POLICY 99.00. WE CAN CUSTOM FIT YOUR NEEDS ONCE YOU CONTACT US OR YOU CAN USE THE BOOK NOW OPTION ON-LINE FOR CONVENIENCE. FOR THE USE OF THE PONTOON BOAT, $500.00 REFUNDABLE CASH DEPOSIT DUE AT CHECK IN.The pool heating is optional except in the month of march. Adjusted quote based on your needs.Pool heating cost is based on the number of days that you are staying, with a 200.00 minimum fee. For shorter stays than the minimum nights, an extra fee of 25.00 per night may be applied, upon management approval of dates. Parties greater than 6 will use the 3 bedrooms and 1 sofa bed. For parties greater than 6 an extra cleaning fee of 100.00 and 25.00/night/extra guest will be applied. You must have owner approval for more than 6 guests. The home could sleep a max of 8 guests using the 2 sofa beds in addition to the 3 bedrooms. Access to the pool is not fenced; not suitable for small children who cannot swim; waiver of responsibility must be signed prior to check in with any guests. Payment is due at the time of booking. Cancellation policy: for stays less than 30 days, a 30 day notice of cancellation/shortened stay is required prior to arrival date for full refund. Cancellations/shortened stays with less than 30 day notice but more than 15 days prior to arrival forfeit 50% of full payment amount. Cancellations/changes less than 15 days prior to arrival forfeit entire payment amount. Early departure does not warrant any refund of rent or deposit. For any stay past the check out time of 10:30 am, charge an extended stay payment approved by the owner. For stays longer than 30 days a 90 day cancellation/shortened stay notification is required for full refund. Check in 4pm MST on day of arrival. Check out is 10:30am MST on departure date.